Scouts • Controversy breaks out in one Utah LDS stake over Friends of Scouting fund drive. File Photo | The Associated Press The annual Friends of Scouting fund drive in Utah has stirred some controversy in one LDS Stake because a local leader in charge of the effort warned members that the money was not staying with the local troop and was helping fuel big salaries for top officials. 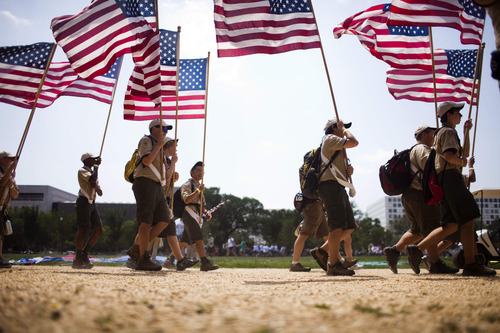 This file photo shows Boy Scouts marching in formation on the National Mall in Washington, D.C.
Kenny Thomas says he could not in good conscience lead the annual Friends of Scouting fund drive in his LDS ward in Herriman without first sending an email to members to tell them that the money helps pay high salaries for Boy Scout executives and doesn't stay with their local scout units. He says that upset his stake president, who persuaded his bishop to release him after four months as president of the ward Young Men organization. The stake president sent him an email saying he was "appalled" at "misinformation" Thomas spread and suggested he did not "follow the prophet." David C. Roth, president of the LDS Herriman South Stake, told The Tribune that Thomas was "released because of his unwillingness to support scouting in general," which is an activity arm of Young Men in the church, "and not just because of what he did with Friends of Scouting." Thomas says, meanwhile, "It's pretty clear I was released because of what I did with Friends of Scouting," and says he only distributed what he feels is truthful information from such sources as The Tribune. "I don't think any member of the church should be afraid of standing up for the truth." The episode comes after The Tribune last month reported about how the LDS Church locally uses higher pressure methods for its Friends of Scouting drives than do other groups nationally, including having stake presidents and bishops ask members for $50 to $100 each, and sending armies of Scouts to knock on every door in their boundaries (including people who are not LDS) to seek money. The story also noted that money from the drives helps pay big salaries. Local scout councils declined to give the current salaries of executives. But past tax forms showed, for example, that former Great Salt Lake Council executive Paul Moore made $228,000 annually before leaving to head a council in Los Angeles where he is paid $383,500. Thomas said he had already been looking into  and was upset by  how the Boy Scouts spent Friends of Scouting money and other funds. He said that started a year ago when he saw his ward was paying far more for what he calls "ramshackle" Scout camps than it was for higher-quality girls camps run by the church. "Facilities were awful, and the latrines were literally unusable," he said. "Friends of Scouting money was supposedly going to help fund the camps, too, but it didn't appear to be percolating down. And anytime a boy wanted to do something there  like shooting or rappelling  they charged an extra fee." Given that, he said he was shocked at how much Scout executives are paid, and said he found online that some charity-rating groups say the salaries are too high compared with other nonprofits. Thomas said he told his bishop before he conducted their Friends of Scouting drive that he felt he needed to tell members about that so they could make an educated decision about whether to give. He sent ward members an email talking about salaries and set up a Facebook page with more detailed information. He said people at church laughed about it and several gave him a thumbs-up for courage. He said many people told him they always mistakenly thought the money stayed with their local Scouts. He said most donated to the drive anyway. One member of his ward who was upset, however, was Roth. He acknowledges talking with the bishop about releasing Thomas and said the bishop decided that was the proper thing to do. Roth said it was because of general lack of support of Scouting by Thomas, which he says is not appropriate for a Young Men's president. Thomas said he sent Roth an email months ago about his concerns, but Roth responded only on the day that he was released by his bishop. Roth's email said, "I have recently received the Friends of Scouting drive for our stake. I am just going to be direct and to the point. I am appalled with the effect that your misinformed actions have had on this effort for our ward. Our donations are about $1,200 less than the goal of $50 per boy, and is significantly less than the other wards in the stake. "Even though our family has already made a contribution to this cause, I will not let your efforts negatively affect the program. I will personally make up the difference. Scouting is endorsed by the prophet. He knows more than you and I about the efficacy and worth of scouting. I trust he has received revelation regarding this. For me, it is an easy and straightforward concept. I follow the prophet," the email said. Thomas said in an interview, "I support Scouting and what it can do for the youth, but am concerned about the administration of the BSA. I think there is a lot of waste, and the salaries are too high. I am not attacking scouting or the church. I would like to see change in BSA administration. I think that most people understand that." After The Tribune talked to Roth, Thomas said the stake presidency requested a meeting with him, which included asking why he had contacted the news media. Thomas says he sees the meeting as a positive, however, because it started a dialogue about his concerns and why he acted as he did. O Kenny Thomas created a Facebook page, available to the public, called Reduce Scouting Costs.